“Middle East: Blueprint for the Final Solution: The Coming Fall and Rise of Western Democracy” written by Mike M. Joseph tells about the on-going crisis in the Middle East caused by religious intolerance. The conflict in the Middle East started, literally, from Isaac’s wife – Rebekah. The Lord said to her that “Two nations are in your womb, and two peoples from within you will be separated; one people will be stronger than the other, and the older will serve the younger.” Her ’struggling’ twins have often engrossed in a love and hate situation. Their descendants have unfortunately spread their struggle for ’the worldwide inheritance’ into Europe, the Americas, and elsewhere. The parade of Islam, of Muhammad; the present conflict between Jews and Arabs; the danger in the Persian Gulf; and the Islamic terrorists and their main target – the West – are a direct result of the twins’ struggle, which actually begun while in their mother’s womb. The book “Middle East: Blueprint for the Final Solution: The Coming Fall and Rise of Western Democracy” was proudly displayed at the 2017 Sharjah International Book Fair which took place this November 1, 2017. Grab a copy now! 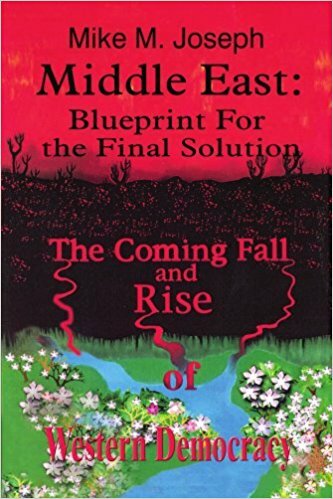 The author, Mike M. Joseph, was born in 1944 to a strict Biblically oriented Orthodox Jewish family in British Aden, Yemen. In 1949, his entire family moved to Israel, after a local Arab pogrom took the lives of his mother and three other brothers. In 1963 the author moved to Paris, France to study French and work in the fashion industry. In late 1965 the author moved to New York where, about four years later, a change in his religious convictions led him to a community practicing both the Old and New Testament teachings and laws of the Bible. From 1970-1975 the author served on the faculty of a local private college in Pasadena, California teaching both modern and Biblical Hebrew to students and ministers on Sabbatical year. At the same time, the author attended classes and graduated with a B.A. degree in Liberal Arts with a major in Theology. After graduation in 1975, and later ordination, Mr. Joseph began his service in the Field Ministry in the Pasadena area congregations. Through the years, Mr. Joseph has published three books and dozens of articles about Biblical, historic, and human relationships subjects. He presently attends a local congregation in the West valley area of San Fernando Valley, California. The author also teaches a Bible Law Series from the Old and New Testaments on the internet website: www.teachingthelaw.org.